Boasting some serious curves, Victoria + Albert’s Cabrits tub takes its inspiration from the exclusive Cabrits peninsula on the Caribbean island of Dominica. The tropical peninsula is a natural product of extinct volcanoes, akin to the Cabrits tub, which is crafted from EnglishCast, a material that incorporates volcanic limestone. 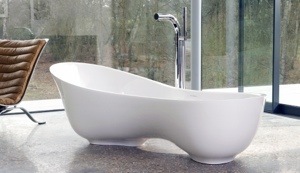 The tub’s organic form features contours designed to support the bather for a soothing experience. Offering a low profile for easy accessibility, the tub has a maximum water volume of 46.5 gallons and measures approximately 68 in. long, 29 in. wide and 22 in. deep.